Welcome back to this MW pirate radio blog, which has been very quiet during an extended summer break that continued into early autumn. August through to the end of October are always very busy for me with work, and this year was no different, which is why I've been so quiet with the hobby. However, I now have more time again, coinciding very well with the clocks going back an hour and giving us shorter days, which is ideal for listening to Dutch pirates. As my location is inland and not near the coast, I am reliant on propagation to bring the signals to me, which is largely possible only during the hours of darkness, so autumn and winter are the peak listening times for me and I'm ready to roll once again. The Wellbrook ALA1530LN loop antenna is working well in conjunction with the MFJ-1026 noise canceller (which is an essential to keep the local noise right down), and the various receivers here are primed for the next few months of pirate tuning. I tend to use the Lowe HF-225 most of the time, or sometimes I switch to the Kenwood R5000 for a change. These receivers, along with plenty of others, are located in my radio room, but I sometimes listen elsewhere in the house using the little Lowe HF-150 which I connect to the Wellbrook loop. Some very sad news I missed a few months ago that I have caught up with only today is that Henk, the operator of Radio Toekomst passed away in April this year. When I first became interested in the Dutch pirates back in the early 1990s, his voice was one that came through my speakers regularly. Henk had a very distinctive tone - and always an almighty signal. I'm sure he proved something of an inspiration to the younger pirates in Friesland and beyond - he certainly made an impression on me during those early listening years. Thanks for the memories, Henk. Today seemed to be the day for testing! 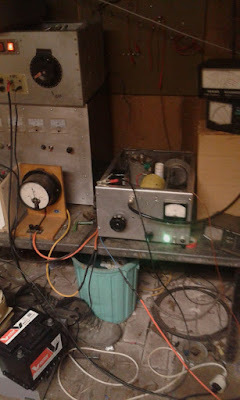 The evening started when I heard Skywire testing a coil antenna on 1644 kHz, and within a couple of minutes I heard Digitaal and Mike Radio testing. That pair were putting very fine signals into the UK, with the punchy modulation of Mike really standing out. The second I heard instrumental music on 1620 kHz I thought it was him. That frequency got even busier a few minutes later when Batavia signed on for a music programme which lasted some hours. When two stations are broadcasting on exactly the same channel you get a mix of the two riding the waves, often taking turns to peak - that can certainly be a challenge when trying to identity stations! It was interesting to catch Paradiso on 1629 kHz this evening. Whenever I've logged him previously it has always been around 1665, and I have usually been able to detect only a carrier. Tonight, however, although the signal was weak, there was clear audio to be heard on this lower frequency. Marconist kicked the day off with an early morning programme on 1620 kHz. I wasn't listening live and set the computer to record the signal from my radio rather than using an SDR. Luckily, I left the radio tuned to 1620 kHz, but I think I might have to upgrade the technology at this side in the coming months which means I would be able to monitor the whole pirate spectrum at a given time rather than picking one frequency and hoping there is a station on air. If it's Tuesday and there's a strong signal around 1625 kHz, then it is almost certainly Marianne, and today was no exception. He was booming across the North Sea for several hours and coming in very well here. Gedrocht van Twente was back on air tonight, but joined by De Vier Ineen (The Four Together). Just the same as last night they were broadcasting all evening but the signal here was not so strong. There were various interesting signals around this evening. Let's start with the one on 1690 kHz which was a test transmission from the UK featuring non-stop music and later a programme from the Bogusman, who listeners on shortwave might well be familiar with. The output power at the start of the transmission was 15 watts, which was later increased to around 50 watts. We can expect more testing in the weeks ahead as changes to the antenna system are made and the earthing gradually improved. The 15 watts was crossing the North Sea tonight and reaching the Netherlands, so that bodes well for the future, when as well as an improved antenna system, there are plans for considerably higher power. Bluebird was busy for most of the evening on 1638 kHz, but he also took some time out for a relay of Radio Igloo with an international programme of oldies. Hopefully this is something we will hear again. A special qsl card was issued for the broadcast, which has been distributed already - this is the one sent to my good friend Terry, which I hope he doesn't mind me reproducing here. He runs an excellent blog which he updates with station logs every day. Take a look here. There were a couple of new names for me tonight, kicking off with the station on 1629 kHz. Unfortunately the modulation was quite low, but the identification (with a little help from my friend Zeewolf) seemed to be Ome Wil, although I am told he also uses the name Pandora 2. He was giving out a telephone number and was on air for some hours. Hopefully it will be a little louder next time! The signal on 1615 all evening was Gedrocht van Twente en de Lachende Vagebond - another new one for me, which translates to the Monster from Twente and the Smiling Tramp. What great names. As you might imagine, the signal in Twente was solid all night, although here in England it was a little more variable but with some good peaks. This station migrated from FM a couple of months ago apparently. Although not listed above, there was some testing also happening on the unusual frequency of 1607 kHz. At around 2020 UTC there were some bursts of music which sounded loud and punchy. This frequency is not great given its proximity to the legal transmissions on 1602 kHz, yet the signal on 1607 was arriving here very well. I have no idea who it was though!